They say if you don't like the weather in Iowa, just wait 'cause it'll soon be different. Tru dat. On Monday of this week, I drove by and saw some of my friends sitting on their front porch in shorts and t-shirts - probably sipping on some nice cold iced tea. The temperature was in the upper 70's. At the time I thought about stopping and taking a photo. Now I really wish I would've taken that pic, because then I'd be able to contrast Monday's weather with what we woke up to on Friday morning. 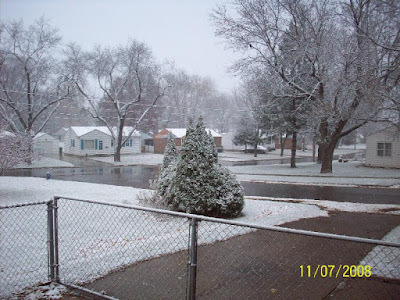 From upper 70's to lower 30's - and a nice layer of snow on the grass and trees. (The pavement is not yet cold enough for snow to stick). The snow was nice and wet - perfect for snowballs! The kids really had some fun before headnig off to school. But within hours, while it was still flurrying and even snowing heavier at times, it had all melted off of the ground. At least we're not in the Dakotas. 40 inches of snow, from what I hear! A little Canadian gift for you! It is comforting to know Abba controls the seasons..and ensures our environment puts put in our bellies. Guess your thanksgiving is coming up soon. SNOW!!! Oh, we are sooo jealous! "before heading off to school..."
Southerners love that fluffy white stuff! Send us some! isn't that 'fluffy white stuff' called cotton? What a beautiful picture! Ha! Indeed, I can relate to those "sudden" changes in weather. When I lived in both Colorado and Washington state, it was common to have gloriously sunny skies, then a few days/week later, it would look quite similar to your picture here. Joel, it looks so festive and seasonal there. May you truly enjoy it. If it's like that on Thanksgiving and Christmas, the aura there will be perfect. Stay warm, my friend. Lots of blankets, cocoa or apple cider? I'm not to happy with "Iowa" right now because they beat my Penn State, (formally undefeated), team!!!!!!!!!!!!!! Poor Joe Pa. It's been so long since we have had a good snow (1 inch or more) I had forgotten what it looked like. Thanks for reminding me. WC... I guess Canada is the gift that keeps on giving. Especially in the winter, sending all its weather down to us. Brother Dave L often speaks of Lake Effect snow as well. I think last year or the year before he spoke of getting 18 inches of snow, almost in a straight line from the bottom of Lake Michigan to where he lives, whereas most of the surrounding area got none. Weird that. Yep, our Thanksgiving is about 2 1/2 weeks away. Amy... yeah, Colorado and Washington... I'm sure they have their share of "weather." Kind of like a box of chocolates - unpredictable and you never know what you're gonna get! People here really do like to have a white Christmas... but they complain about the snow for the other 4 or 5 months that we have it! I'm just hoping this isn't a sign for a repeat of last year. We had six straight months in which we had ice and/or snow - November to April! Anonymous... What an amazing game that was! (Sorry for you though). :) For me, the sad thing was that I turned it off before it was over. Actually, I'm usually working on Saturdays while the game is on, so I listen on the radio and then when I get home I finish watching on TV. This time around, I figured it was over and I simply decided to not turn it on when I got home. Didn't hear the end result until this morning. I was walking into a convenience store and I heard two guys talking. "Did you watch the Hawks yesterday?" "Yeah, how awesome was that!" I immediately bought a newspaper and read about the last second winning field goal. We've lost so many close ones this year... I guess it was our time to win one of those close games! But yeah, too bad for your undefeated record. Still... I really do love that we truly have all four seasons in all their glory here in the midwest. Angela... Yeah, those big hills you're training on would be a little harder with Iowa's snow and ice! I quickly looked up info on the climate in Vancouver. Very interesting... I didn't know it's one of the warmest of the large cities in Canada. Looks like your area has somewhat of a complex weather system, with all kinds of variables that come into play, from the mountains on Vancouver Island to the warm Japan current to the sea breezes, etc. "Microclimates" is the word I found that describes your climate. San Diego is the only place I've been that has that kind of microclimate effect. They have four different forecasts on each given day. One for the coast, one for the inland areas, one for the mountains and one for the desert. All within 90 minutes of each other. Interesting stuff! In Michigan, and remember were surrounded by the Great lakes, we say, " If you don't like the weather stick around 5 minutes cause it'll change, and it does. Jamie, I'm telling Ryan what you said about sending snow, He's the poor aching back who'd have to shovel it... poor fella. Joel, what a gorgeous picture! I always look forward to seeing the beautiful snow in Iowa and I'm always glad it's not in S. C. I had enough of that in N. J. many years ago. I'm hopng too that you'll have better weather than you did last year. Between snow and floods, it was rough in th midwest. Hopefully I won't have the same kinds of pics to share this winter as I did last winter! That was just unbelievable, even for Iowa (but yet probably not comparable to Michigan). In case anyone missed it, here are a few links from last winter. Sorry ladies out there! I don't necessarily agree to this, but people say it! Crazy!
" every 5 minutes "
I've not heard the "women" one though, and, um, I guess I won't comment on it either! Vancouver is quite unique in its climate/weather…Most winters we get no snow in the city but the local mountains have 3 ski hills…In winter you can golf, sail and downhill ski along the same ocean front on the same day…it is truly spectacular except for those all to common days when the inundation of rain and overcast dominates.. I love San Diego it is one of my favorite cities…the water access is excellent!